For those of you who have had good results with body contouring products with caffeine (it provides a draining effect on the skin), this latest innovation from Yves Rocher is worth looking into. The company spent four years researching the effects of the Green coffee bean to reduce the appearance of fat, and slimming/firming effects on the skin to create Yves Rocher Minceur Café Vert D-14. They found that the particular variety of Green Coffee Bean researched had the highest concentration of the active concentration of caffeine which decreases the volume of fat cells (3x as effective as standard caffeine). I found that this formula does indeed have a noticeable effect on the firmness of skin in areas like the upper leg, thighs and after using 2x day for 2 weeks, as they advise, I was pretty pleased with the results. I could see smoother skin overall, the areas felt and looked tighter as well. 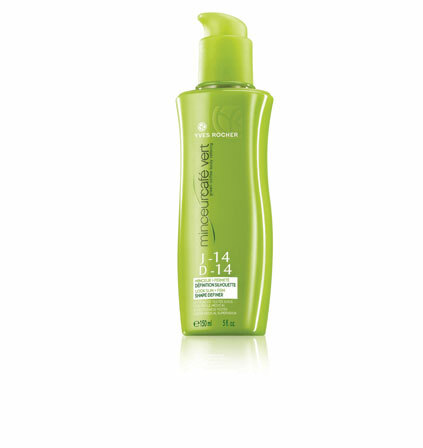 The gel/lotion formula is a light cream color, lightweight, has a great fresh scent and is also moisturizing. It didn't feel sticky or interfere with any other products I may have been using. I've continued to use it after the test period and the results have remained consistent. If you're using this type of product you must keep in mind 1) If you have significant amounts of fat this is not a instant miracle; 2) watching your diet and being as active as possible of course enhances the results.